A candidate must be judged worthy of becoming a member and be deemed acceptable by the Board of Managers. View Eligibility list and the list of Colonies [PDF] Other society documents are available on the members’ pages [log-in required]. For more information on becoming a member please email admin@cda1890.org or call (212) 838-5489. 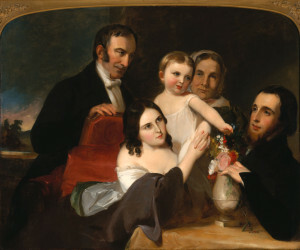 This Thomas Sully portrait depicts the Alexander family, ancestors of Dames from Chapter X-Rome and Chapter I-Baltimore. Commissioned by Mark Alexander, this work was painted by one of America’s finest portrait painters, Thomas Sully (1783-1872). It depicts four generations of the Coleman/Alexander family: Mark Alexander and his wife Anne Gordon Coleman Alexander; John Coleman and Pricilla Sims Clark, Anne Gordon Coleman Alexander’s father and grandmother, and Elizabeth Clark Alexander, daughter of the Alexanders. (At one point the portrait of Pricilla Sims Clark was painted out and was later uncovered). The portrait was completed in 1851. The Colonial Dames of America is grateful to Ambassador J. William Middendorf for the use of this spectacular piece of American heritage. The ambassador is the father of Frances Middendorf, member of Chapter X-Rome, and the great-great-grandson of Elizabeth Clark Alexander. Click image for closer view of portrait.